Tag Archive | "Bruce Wayne Beck"
The driver who crashed into this home on 14 Mile Road Monday may have suffered a medical emergency. Photo courtesy of the Rockford Squire. A resident in the home located on the southwest corner of Myers Lake Road and 14 Mile Road (M-57) heard two crashing sounds before a final one shook the house. She found that a Jeep Patriot had left the road, gone down and up a hilled area, taken out a road sign, and narrowly missed a large pear tree before striking her home, at 7156 14 Mile Road, just before 12:23 p.m. on Monday, October 20. According to the Kent County Sheriff Department, the driver may have suffered a medical emergency. They reported that a witness said that the driver, identified as Bruce Wayne Beck, 69, of Gowen, was slumped over the wheel as he entered the intersection, and never tapped his brakes or made any attempt to slow down before hitting the home. First responders to the scene worked on the driver, the sole inhabitant of the vehicle, for nearly an hour before transporting him to a downtown Grand Rapids hospital with a life-threatening medical condition. After removing the driver from the vehicle, they performed chest compressions in attempts to stabilize him before transportation via Rockford Ambulance. 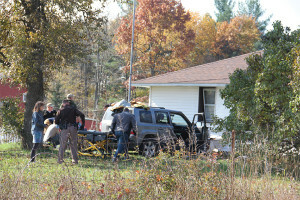 Responding to the scene was Courtland Fire and Rescue, the Kent County Sheriff Department and Rockford Ambulance. The resident of the home said she didn’t immediately realize what had happened, but noted that there are numerous accidents at the intersection. No one in the home was injured.